Sky Blue is located in Dawn Beach Estates, a private gated community near one of the most popular snorkeling beaches on the island. The villa has panoramic ocean views from every room and two levels of space. 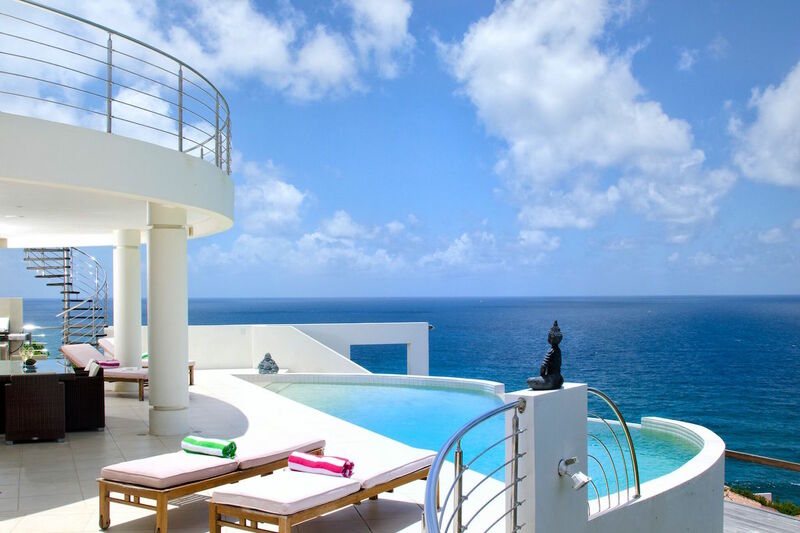 The villa’s main level has a plunge pool that seems to blend with the ocean. There are chaise lounges, shaded and unshaded, for guests to take in the ocean view. The al fresco dining table is under a columned portico, with a full view and interior access. The terrace blends with both living rooms, one exterior and one interior. The interior living room faces the view and sits between the kitchen and dining area. The gourmet kitchen features a sleek, open floor plan and state of the art appliances. The breakfast bar sits on the opposite side of sliding glass doors from the gas BBQ grill. There are two guest bedrooms on the main level, both with king-sized beds and ensuite baths. There is also a fifth bedroom on this level for staff. A spiral staircase leads from the main level to the upper story, which has an outdoor terrace with views of Oyster Pond, St. Kitts, and Nevis. The master bedroom is on this level, with a king-sized bed, flat screen TV, walk-in closet, and ensuite bath. The second bedroom on this level also features a king-sized bed and ensuite bath. Sky Blue is located near the ferry service, Dawn Beach, and the Westin Resort. Orient Bay’s water sports and Philipsburg’s shopping are a 10-15 minute drive away. We spent a week at Sky Blue and were not disappointed. We loved the open layout of the property and overall privacy of the lot. The view out over the infinity pool was spectacular. We made use of the gourmet kitchen and dining areas inside and out…and it made for many relaxing days by the pool. Liked the fact that this was in a gated community with a guard 24hrs a day. This was our second time renting through WheretoStay and working with Shawna…her knowledge of the islands and properties is top notch and always puts me at ease knowing we won’t be disappointed. Her professionalism and timely communication/responses make me a repeat client! Sky Blue is absolutely breathtaking! The view is second to none and the villa is exactly as it looks in the pictures. I have stayed in a lot of great places around the world, but I would rank this as one of my all time favorites. Sharon was awesome to work with and I will definitely use WhereToStay.com for my next trip.